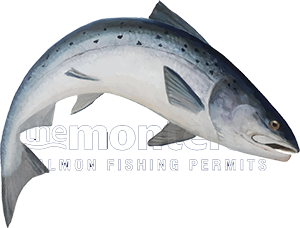 There's a vast array of tactical salmon fishing skills and approaches to learn for success in salmon fishing. One of the biggest attributes for success in Scottish salmon fishing is having the ability to control your mind as success often does not come within your first few casts of the day. In saying that I have hooked salmon on numerous occasions with the very first cast of the day and even while extending a line for a client before he started to fish I've seen the fly grabbed as I was handing the guest the rod. These instances however are few and far between and most of the time you've got to persevere for that one 'take' at some point throughout the course of the fishing day. When all of us are en-route to the salmon river there's a huge sense of expectation & excitement that never seems to leave us. As a professional career ghillie this never diminishes and every day is an exciting adventure and even more so for recreational salmon fishers who can only visit the river a few days of the year due to their own personal work & life commitments. The recipe for success in Scottish salmon fishing is to keep your expectation levels low and your perseverance levels high. Don't allow your enthusiasm levels to dip if you've not seen a splash after the first hour or two. The opportunity to catch a salmon will always be there on any Scottish salmon beat at some point in the fishing day so realise the game you're playing and understand exactly how it works. If your water coverage is good enough and you know exactly how to hook a salmon when that opportunity arises then just keep going. Take your mind off the task in hand but keep fishing methodically & correctly down through the salmon pools. It is often during this almost hypnotic 'automatic pilot' state when a salmon takes which will instantly wake you up and sharpen your senses like nothing else can do. This initial tug is a huge part of the thrill for many and probably much to do with the instant adrenalin rush it creates. Look at the salmon river as a 'live' shooting range with moving targets that 'pop up' from time to time but not all the time. We often do not see when a few running salmon appear and stop in a pool in a state of excitement that would readily take a salmon fly if one was there. With that in mind fish with confidence that sooner or later you're going to swing your fly in front of a cooperating salmon and if you don't at least you know you've given it your best tactical approach throughout the entire fishing day. It takes skill to catch an often elusive & completely wild fish like an Atlantic salmon so make sure you know as much as you can about effective water coverage. Don't expect results if you've not obtained a good grounding in the correct salmon fishing tactics. Once you've learned enough of what you need to know you'll develop an inner confidence that will more or less guarantee you a tug on the fly during most outings to the salmon river.